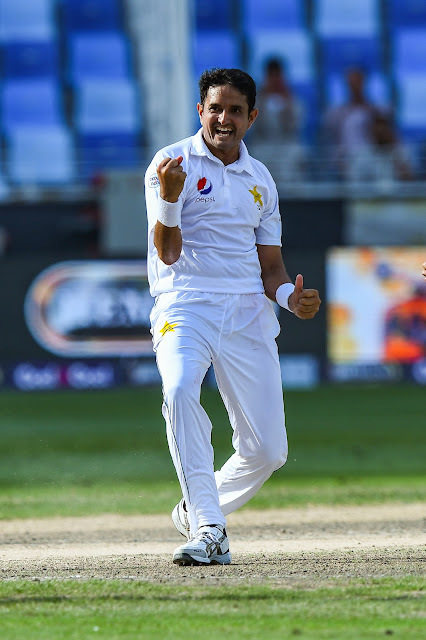 Mohammad Abbas has quickly risen to the status of Pakistan's premier pace bowler in tests. While it was Bilal Asif who ripped through Australia in the first innings of this test, Abbas played a crucial role as well ensuring a strong lead for Pakistan. Abbas then follow up his first innings 4-29 with another special spell in the second innings where he picked up 3 wickets in the space of 7 deliveries for no runs that left Australia reeling at 87-3. Abbas is special and he is one wicket away from his 50th test wicket in only his 9th test. Another wicket today and he will join Yasir Shah as the quickest to 50 wickets among Pakistan bowlers. Better than that, he will become the quickest among pacers from Pakistan, breaking the 10-test record set by Waqar Younis, Mohammad Asif, and Shabbir Ahmed. "Firstly as a batsman or as a bowler, you need to know your strengths. I just concentrate on my strengths. On these kinds of surfaces I try and stick to my line and length and I bowl in the right areas. I try to keep the batsman quiet. As soon as the ball starts reversing, I attack. I think that's one of the reasons why I am successful. When you talk about pace, among the four fast bowlers here, my fastest delivery is 138 kph and average speed is 130 kph. I am happy with this speed. I'll keep on working on my fitness in order to keep getting opportunities"
"I adjust according to the conditions. Thank God I was the man of the match and man of the series in England. I feel I am the main bowler in our Test team. I compete with myself. I always look to improve from my last performance"
"I feel I am not under pressure, rather the opposition is wary of me as they are planning against me. In the first innings the first wicket fell for 142 and at 87 in the second innings. I stuck to my line and length. I eventually struck, so I was really happy"
"I have benefitted from the County circuit a lot. It was pretty hot there this season. I got reverse swing going as well. On Day 4 in Leicestershire the ball keeps low as well. The wickets are like we have in Sind/Karachi. I played 10 games and got around 50 wickets. My aim was to continue the good work and serve my nation"
"I think the wicket isn't going to change a lot. I want to say something here. The most number of wickets in first 9 Tests for Pakistan is by Yasir Shah's, but as a fast bowler, it's Waqar Younis, Mohammad Asif and Shabir Ahmed (they had 50 in 10 games. My aim before the game was to become the fastest t 50 wickets for Pakistan. One more to go, Insha'Allah I'll get that tomorrow morning"
"My first target will be to complete fifty wickets in the morning and contribute towards my team's victory. I'll keep on working hard - it's up to the selectors and team management if they want me to be part of the white-ball set up"
"I know what my strength and limitations. I limit myself to that. I try and bowl according to the conditions and what the team requires from me. I stick to the plan. I feel that is the reason behind my success"
"My speed ranges between 130 kph & 138 Kph. I try and keep the batsman quiet. I bowl wicket to wicket. I feel that's the reason behind my success"
"We'll try to wrap things up as quickly as possible. We shouldn't forget it's an Australian team after all. We'll need to be patient. We'll try to get them out before Lunch. They are under pressure, we aren't"
"Last year I got 8 wickets in two games, which was the most by a fast bowler in the series. In all my series, I have been the top wicket taker among the fast bowlers. I bowled in the right channels and was very patient"